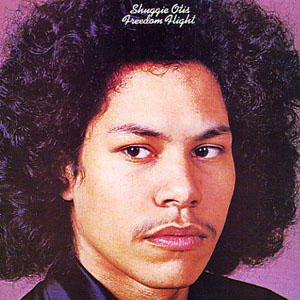 Whether in conversation or on this blog, I constantly reference Shuggie Otis. There's something truly beautiful and mysterious about him and his music. When I first scored his 'Inspiration Information' LP, I think I spent an entire week in my apartment with the headphones on. I was obviously blown away and affected, but it went even further than that. Somehow I had dreams those nights about Shuggie jammin' with the school band at Berkeley High. It was some kind of great hippie psychedelic soul jam session. I've often used that dream to describe his music, and although it doesn't encapsulate his 'sound' (as it's only my individual experience) Shuggie has created 'dream' music for his fans. He definitely left some kind of celestial imprint in my musical tastes. In that LP he's etching out a new brand of 'Hippie Soul' (among other things) and with this LP he launched one of my all time favorite tracks EVER...'Strawberry Letter 23'. This song 'Ice Cold Daydream' is on the flip of a 45 I have of 'Strawberry' and the opening tune on his 1971 'Freedom Flight' LP. This LP came out a year later than his previous more bluesy 'Here Comes Shuggie...' LP, but was light years beyond it. It was apparent that his sound was evolving and in 1974 when 'Inspiration' dropped it fell on deaf ears. Critics panned his moving away from the blues sounds and claimed he had lost his way. Years later it was of course discovered by soul enthusiasts, and heralded up there right along with other landmark Bay Area LP's like 'There's A Riot Goin' On' By Sly and the Family Stone. Then, it was re-released by Luaka Bop and it finally met with universal acclaim. As a result of his new found 'fame' I had to the chance to see him at Great American Music Hall in SF, but he was 'out of sorts' and almost canceled the performance. I had heard of people trying to reach him, and often knocking on his door with no response, or being told to 'go away' by Shuggie himself. This is a sample of his more psych rock sounding stuff, but Shuggie is unconventional to say the least and his music knows few boundaries. In any instance of his music you'll hear vast varieties of both sound and mood and a bevy of unpredictable changes in the song writing. I'm posting this song 'cause i love it, but also I'll be heading down a 'rock' path in the next few weeks. There will be more Shuggie snippets to come in the future as I'm a huge fan. Thanks for letting me vent about my love for Shuggie, and have a happy Ice Cold Daydream.